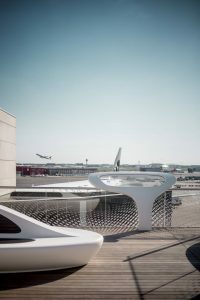 Opening this Spring, Fraport AG, the operating company of Germany’s largest aviation hub, has opened an innovative roof terrace to the departure area of Frankfurt Airport, Terminal 1. As of April, the “Open Air Deck” in the transit zone welcomes visitors with a dramatic view over the airport apron. Not only is the view spectacular – but the HI-MACS® furniture is an eye-catcher, too, with an inviting seating area. 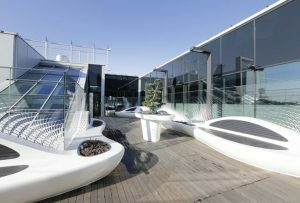 The furniture for the 138-square-meter terrace was designed by the award winning Studio 3deluxe. The interdisciplinary creative team has been operating in architecture, design and art since 1992 and is known for its organic approach to design. The “Open Air Deck” is part of the indoor “Leisure Zones” series, which were implemented at Frankfurt Airport in 2011. 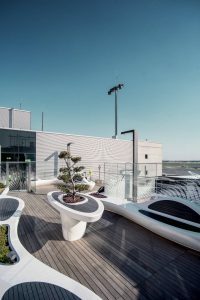 This rest area, used as a place to calm down in the midst of busy airport activities, features dynamic curved furniture and its design features were also adopted for the roof terrace. The organically-shaped bench seat made from HI-MACS® Alpine White runs alongside the glass balustrade. The roof terrace enhances the transit traveller’s quality of stay in a unique way. 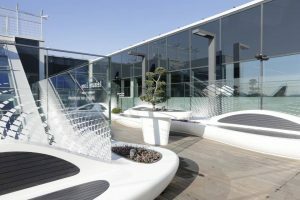 After flights that often last for hours, the terrace offers the opportunity to breathe freely in the open air and enjoy the sunlight. 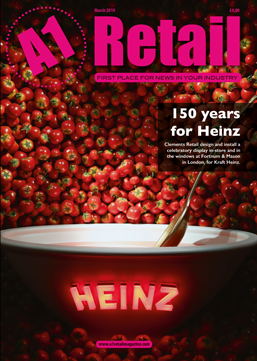 The designers opted for HI-MACS® for the 20 linear metres lounge furniture. The solid surface material is resistant to UV-rays, , water and temperature fluctuations. Hence the material will remain beautiful and durable for many years. Besides longevity properties, the solid surface is also the only material that had the ability to be thermoformed seamlessly and crafted exactly the way envisioned for the organic furniture of the “Open Air Deck”. The Bavarian company Georg Ackermann GmbH is responsible for the workmanship of the seat and table sculptures. The creative contractor with over 120 employees is a long-time and skilled HI-MACS® fabrication partner. Within four weeks, the company prefabricated the elaborate thermoformed furniture made from the solid surface in its Wiesenbronn factory. Each piece of lounge furniture is curved in two axes with, at times, very narrow radii. The two-week assembly phase at the airport and the logistics involved posed a real challenge for Ackermann: Only at night, when the flight operations slowed down, were the individual parts transported across the apron and then lifted with the help of crane onto the roof terrace. The flowing shapes were glued and polished on-site to give the iconic, seamless finish. The silky soft feel of the surface material offers the visitors to the terrace a sensuous experience that only the solid surface material delivers. Ackermann GmbH selected a substructure using a frame construction on which the solid surface components were attached so that the furniture would not be too heavy. This lightweight construction is borrowed from shipbuilding and aircraft construction. The fabricators prepared the three-dimensional production drawings on the computer. 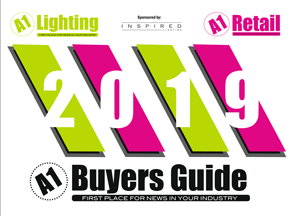 The individual parts – all of different dimensions – of the stainless steel substructure were manufactured using a CO2 laser cutting machine and then welded. The frames are made from stainless steel to ensure a durable exterior construction. Valuable thermo-treated ash wood was used as a contrast for the seats and the backrest surfaces of the HI-MACS® furniture. The wooden segments, also used in the planted feature, were carefully fitted into the solid surface material. At the eye-catching information display, also made from HI-MACS®, visitors can learn interesting facts about operations on the airport’s apron area.